RICHMOND – Some teams struggle in the second half after a back-and-forth battle to start off the game. GW is not one of those teams. The Colonials sent themselves to the Atlantic 10 finals with a 72-60 victory over Fordham in the Richmond Coliseum on Saturday. 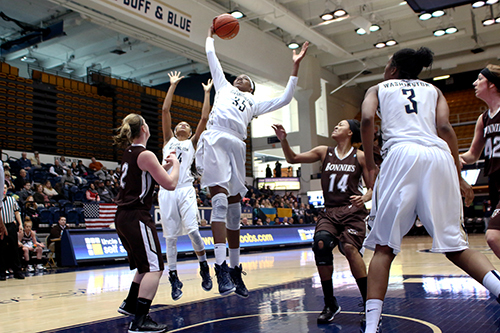 The game was a remarkable parallel to GW’s win over Saint Louis on Friday. Like Friday’s game, the Colonials had to battle tooth-and-nail with their A-10 foe for the entirety of the first half. In Saturday’s game, Fordham and GW exchanged the lead throughout the first half, marking the first time the Colonials have trailed in the young postseason. And like the game against Saint Louis, GW came out of the gate hot in the second half. The Colonials scored 13 points in the first 5:21 of the half, putting the distance they needed between themselves and the Rams. The Colonials had four players score in double digits. Junior forward Jonquel Jones and sophomore guard Hannah Schaible both had 16 points, and Jones pulled down 15 boards, her 19th double-double of the season. Jones’ frontcourt mate Caira Washington had 10 points, and fellow starter Chakecia Miller rounded out the high scorers with 11. A noticeable difference between the two games was the physicality of Saturday’s contest. If at first glance spectators thought it was closer to a football game than a basketball game, they’d be forgiven. GW and Fordham combined for 47 fouls throughout the game, and players dove for every loose ball on the court. The number of fouls ultimately benefitted GW. Fordham’s big, Samantha Clark, had to return to the bench in the first with three fouls. Before she sat, Clark scored nine in the first half. Clark and another Fordham starter, Emily Tapio, would then both foul out late in the second half in quick succession, dampening Fordham’s chances of making a late push. Before they both fouled out, the two combined for 22 points. Fordham’s fouling in the first half also sent GW to the line 16 times, and they made the Rams pay for it. They sank 13 of their first-half shots from the charity stripe compared to the four the Rams hit. But one concern for the Colonials was Jones, who was seen limping off the court late in the game after her team had all but locked in the victory. They’ll be no rest for the weary, as the Colonials will look to capture their first conference championship since 2003 on Sunday. They will face the winner of Dayton and Duquesne’s semifinal game Saturday.